This ticket allows general admission to Cocoon in the Park on Friday 13th July 2019 at Temple Newsam, Leeds. This is a VIP ticket for Cocoon in the Park 2019 on Saturday 13th July. VIP ticket includes access to a special raised platform overlooking the stage, a private bar, cocktails, private toilet facilities and fast track entry into the festival. Jurys Inn is located on Brewery Wharf by the River Aire and is just a 10 minute walk away from the city's main shops. All 248 guest rooms have free Wi-Fi internet access, are spacious and feature a flat-screen TV with a large bathroom and free toiletries. Guests can enjoy a drink in the on-site bar in the contemporary restaurant serving a range of dishes from an international dinner menu and also serves snacks and coffee. Just a short walk from Leeds train station, 25 minute drive from Leeds Bradford International Airport and close to Leeds Kirkgate Market - one of the largest indoor markets in Europe, Jury's Inn is perfectly located to enjoy what Leeds as to offer. In a superb location, Doubletree by Hilton Leeds is part of the Granary Wharf area, next to Leeds Train Station and the canal. The Victoria Quarter is a shopping district nearby. 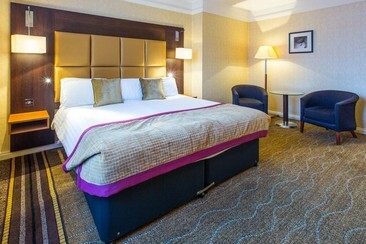 Doubletree by Hilton Leeds has comfortable, modern rooms, featuring a 42-inch Smart TV, complimentary Wi-Fi internet access and mineral water. The hotel's sleek City Cafe restaurant offers intimate dining and modern European cuisine, while the terrace provides al fresco dining. Enjoy a drink in the Skylounge, with panoramic views of the city or in the lively Granary Lounge. Local attractions include Opera North, Leeds Grand Theatre and Leeds City Square, all within walking distance of the hotel. 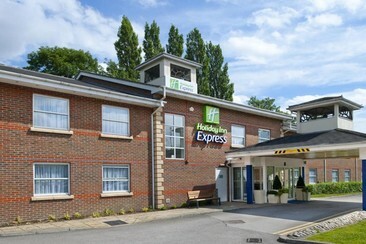 Holiday Inn Express Leeds - East is conveniently located just 7 miles from the centre of Leeds and is close to both the M62 and the M1, making it easily accessible no matter where you’re travelling from. The shops and restaurants of Trinity Leeds shopping centre and the nightlife of the Northern Quarter are a short 12-minute train ride away in the city centre. Explore the country mansion and parkland at 500-year-old Temple Newsam House, just 5 miles away. All room are designed with your comfort in mind, this bright and modern hotel has 77 rooms, including double rooms, twin rooms and family rooms, as well as four dedicated accessible rooms, with plenty of extra space. This property also offers comfortable and spacious meeting room for a small meeting or conference. 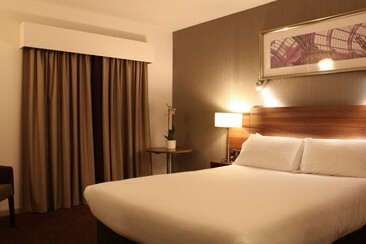 Situated beside Leeds' city centre, The Clayton Hotel Leeds is just off the M1, at Junction 3 of the M621 motorway. Leeds Bradford International Airport is just 20 minutes' drive away. Offering links to the airport, Leeds Railway Station is within walking distance. Guests can make use of the gym. 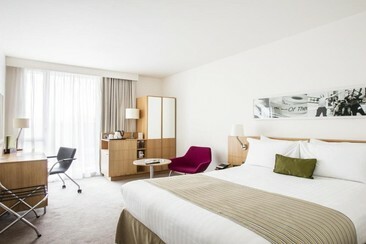 The bright and stylish rooms are spacious with modern furnishings. 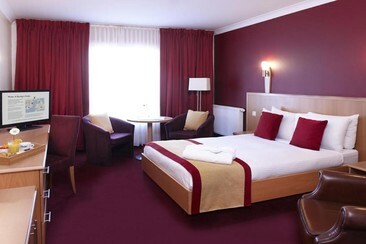 All rooms are fully soundproofed and offer comfortable duvets and hypo-allergenic pillows. Rooms also include a private bathroom with power shower. There is a TV in each room, along with a hairdryer and tea/coffee facilities. Buffet breakfasts are provided, while light lunches and drinks are served in the relaxed Inkwell bar, which shows live sports and hosts events throughout the week. The Brasserie Restaurant provides international cuisine, a carvery, and children’s menus. The property offers a wedding and event room. Leeds Shopping Plaza, along with many of Leeds’s central shops can be reached in less than 15 minutes' walk. The M621 motorway is just a 5-minute drive, and The Royal Armouries Museum is just 5 minutes away by car. As the most famous landmark hotel in Leeds, The Queens really does set the standard. Proudly positioned in the heart of City Square adjacent to the rail station and a host of other amenities, The Queens Hotel radiates a powerful allure from every inch of its immaculate white Portland stone façade. But the beautiful frontage is no façade, as you’ll discover when you step inside. The perfect balance of old character and contemporary elegance, The Queens Hotel Leeds combines its proud 1930s Art Deco heritage with modern 4 Star luxury. Briggate Boutique Apartments offers accommodation in Leeds, 100 yards from Trinity Leeds and only a 4-minute walk from Leeds train station. 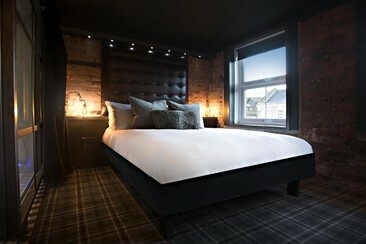 Briggate Boutique Apartments boasts views of the city and is 750 yards from Leeds Town Hall. An oven, a refrigerator and a stovetop can be found in the kitchenette. A flat-screen TV is featured. The area has a variety of bars and a nightclub is located next to the apartments. The property operates a 24 hour reception area. 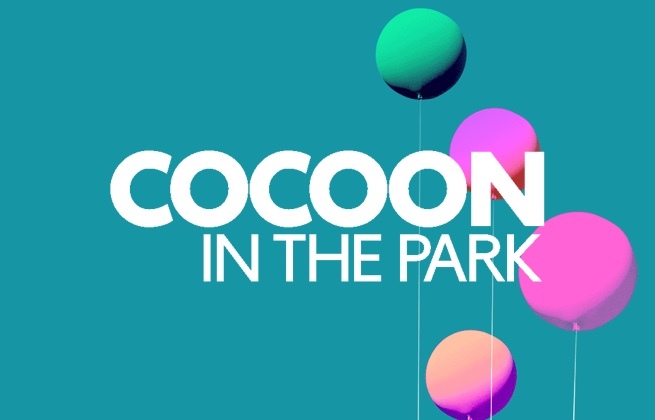 Cocoon in the Park is a Leeds house and techno music festival curated by Sven Väth's record label of the same name. Showcasing a lineup of some of the legendary producers favourite artists inside the grounds of a Tudor-Jacobean house, Cocoon in the Park is eleven hours of dance bliss, complete with captivating production and stage dancers. And when the festival finishes, ravers descend on Leeds' city centre to carry on the party till sunrise inside some of the city's hip, trendy music venues.